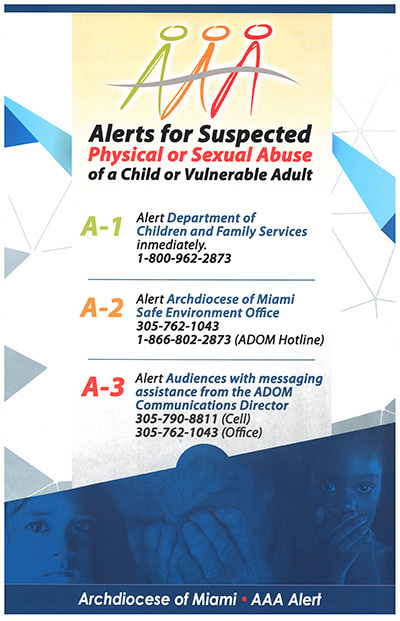 The goal of the AAA alert poster is to remind pastors and other church personnel of the steps to take if they witness or are told of suspected abuse of children or vulnerable adults. 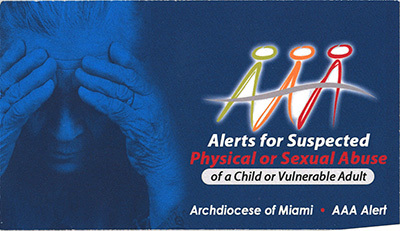 MIAMI | Just like calling AAA can be a lifeline for drivers stuck on the side of the road, the Archdiocese of Miami is hoping a different AAA can rescue — and possibly prevent — children and vulnerable adults from abuse. To make it even easier to remember, the information will be distributed to archdiocesan clergy, employees and volunteers in the form of hundreds of posters and 10,000 business cards. The business cards were suggested by Corpus Christi’s pastor, Father Jose Luis Menendez, as a way to help people quickly access the information. “It was a great idea and we’re following his suggestion,” said Mary Ross Agosta, who combined her dual jobs as archdiocesan director of Communications and director of the Safe Environment office to come up with the AAA format. 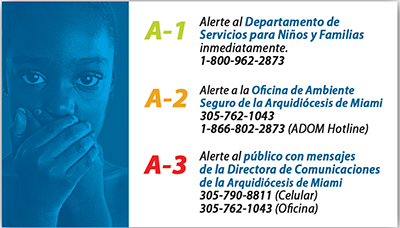 Front of business card-size AAA alert to remind pastors and other church personnel of the steps to take if they witness or are told of suspected abuse of children or vulnerable adults. After civil authorities are alerted, the archdiocese must be made aware of the problem. The Safe Environment Policy states that “all allegations of sexual abuse by Church personnel or on church premises shall be reported promptly to the Archdiocesan Contact Person,” who in turn will notify the archdiocesan attorney, so that he can notify the local State Attorney. That “contact person” is the one who answers the archdiocesan abuse hotline: Ross Agosta or the Victim Assistance Coordinator, Deacon Richard Turcotte. The AAA states that those undertaking this third step will receive “messaging assistance from the ADOM Communications Director.” The numbers that follow are for Ross Agosta’s office and cell phones. The business cards and posters should be in the hands of all archdiocesan priests, parishes, schools, Catholic Charities and Catholic Health Services facilities by the end of May. That’s a total of almost 6,000 employees and volunteers, Ross Agosta said.